The weather phenomenon known as El Niño can cause dramatic effects around the world. Henry Fountain explains where it comes from. By Henry Fountain, Aaron Byrd and Ben Laffin on Publish Date September 9, 2014. 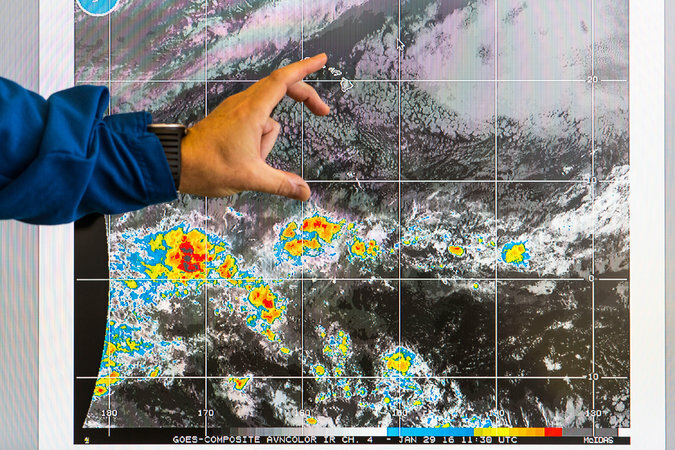 A thousand miles south of Hawaii, the air at 45,000 feet above the equatorial Pacific was a shimmering gumbo of thick storm clouds and icy cirrus haze, all cooked up by the overheated waters below. 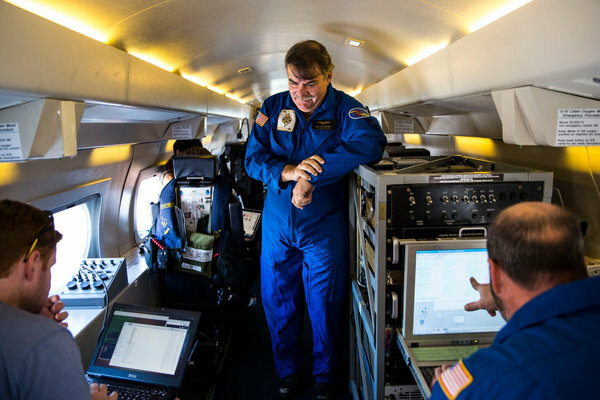 In a Gulfstream jet more accustomed to hunting hurricanes in the Atlantic, researchers with the National Oceanic and Atmospheric Administration were cruising this desolate stretch of tropical ocean where the northern and southern trade winds meet. It’s an area that becalmed sailors have long called the doldrums, but this year it is anything but quiet. A satellite image of the area of the Pacific where a NOAA research team would be flying. The plane, with 11 people aboard including a journalist, made its way Friday on a long westward tack, steering clear of the worst of the disturbed air to the south. Every 10 minutes, on a countdown from Mike Holmes, one of two flight directors, technicians in the rear released an instrument package out through a narrow tube in the floor. Slowed by a small parachute, the devices, called dropsondes, fell toward the water, transmitting wind speed and direction, humidity and other atmospheric data back to the plane continuously on the way down. Leonard Miller, a NOAA technician, left, testing an instrument package called a dropsonde that was set to be launched from the plane’s delivery system, right. An El Niño forms about every two to seven years, when the surface winds that typically blow from east to west slacken. As a result, warm water that normally pools along the Equator in the western Pacific piles up toward the east instead. Because of this shift, the expanse of water — which in this El Niño has made the central and eastern Pacific as much as 5 degrees Fahrenheit hotter than usual — acts as a heat engine, affecting the jet streams that blow at high altitudes. Aided by vast processing power and better data, scientists have improved the ability of their models to predict when an El Niño will occur and how strong it will be. As early as last June, the consensus among forecasters using models developed by NOAA, as well as other American and foreign agencies and academic institutions, was that a strong El Niño would develop later in the year, and it did. But scientists have been less successful at forecasting an El Niño’s effect on weather. This year, for instance, most models have been less certain about what it will mean for parched California. So far, much of the state has received higher than usual precipitation, but it is still unclear whether Southern California, especially, will be deluged as much as it was during the last strong El Niño, in 1997-98. Anthony Barnston, the chief forecaster at the International Research Institute for Climate and Society at Columbia University, who has studied the accuracy of El Niño modeling, said that so-called dynamical models, which simulate the physics of the real world, have recently done a better job in predicting whether an El Niño will occur than statistical models, which rely on comparisons of historical data. With a dynamical model, Dr. Barnston said, data representing current conditions is fed into the model, and off it goes. “You plug it in and you crank it forward in time,” he said. This can be done dozens of times — or as often as money will allow — tweaking the data slightly each time and averaging the outcomes. With any model, good data is crucial. El Niño models have been helped by the development of satellites and networks of buoys that can measure sea-surface temperatures and other ocean characteristics. When it comes to forecasting El Niño’s weather effects, however, good data can be harder to come by. That’s where the NOAA research project aims to help, by studying a key process in the El Niño-weather connection: deep tropical convection. Alan S. Goldstein, the radar monitor for the mission, with other researchers before the flight. The clouds that the NOAA jet cruised past on Friday were a result of this process, in which air over the warm El Niño waters picks up heat and moisture and rises tens of thousands of feet. When the air reaches high altitudes — about the flight level of the Gulfstream — the moisture condenses into droplets, releasing energy in the form of heat and creating winds that flow outward. Scientists know that the energy released can induce a kind of ripple in a jet stream, a wave that as it travels along can affect weather in disparate regions around the world. And they know that the winds that are generated can add a kick to a jet stream, strengthening it. That’s a major reason California and much of the southern United States tend to be wetter in an El Niño; the winds from convection strengthen the jet stream enough that it reaches California and beyond. But to study convection during an El Niño, data must be collected from the atmosphere as well as the sea surface. That’s a daunting task, because the convection occurs in one of the most remote areas of the planet. As a result, there has been little actual data on convection during El Niño events, Dr. Dole said, and most models, including NOAA’s own, have had to make what amount to educated guesses about the details of the process. “Our strong suspicion is that our models have major errors in reproducing some of these responses,” he said. Dr. Dole estimated that it would normally take two or three years to put together a program they assembled in about six months. In a way, he said, they were helped by the developing El Niño, which suppressed hurricane activity in the Atlantic last fall. The Gulfstream flew fewer missions and the available flight hours, as well as extra dropsondes, were transferred to the project. In addition to the jet — which is also equipped with Doppler radar to study wind — the program is launching other sondes, from a ship and a small atoll near the Equator. A large remotely piloted aircraft from NASA, the Global Hawk, has also been enlisted to study the Pacific between Hawaii and the mainland. The Gulfstream flight Friday was the researchers’ fourth so far, out of nearly two dozen planned over the next month. The day began at Honolulu International Airport five hours before the 11:30 a.m. takeoff when Ryan Spackman, the other lead investigator, and NOAA colleagues sat down for a weather briefing with Dr. Dole and other scientists at the agency’s offices in Boulder, Colo. The original plan was to fly due south from Honolulu and around an area of convection — a “cell” in meteorological terms — near the Equator. But when the plane’s three pilots arrived for their briefing several hours later, the plan was changed out of safety concerns. There was a risk they would have no way to get back from the south side of the convection area without going through a storm, and the Gulfstream, unlike NOAA’s other hurricane-hunting planes, cannot do that.